Neuropsychological evaluations are comprehensive assessments of the student's brain functioning through the use of a diagnostic interview, behavioral observations, and neuropsychological testing. Who might benefit from a neuropsychological evaluation? How long is the evaluation, and what should I bring? The time required depends on the child’s age and problem, but usually the evaluation is four to six hours. Make sure your child has a good night’s sleep before the testing. If your child wears glasses or uses a hearing aid or any other device, make sure to bring them. If the student is taking medication, please have him/her take it on the day of testing. Please bring all previous school testing, an individual educational plan (IEP), and report cards if possible. Please either bring medical records, or sign a release for Dr. Toby to talk to your/your child's doctor. The best explanation is simple and brief, and is related to the student's own wording, such as, "Remenber you said you had trouble reading/following directions/with feeling sad, etc. That's what this is for, to help you with that." 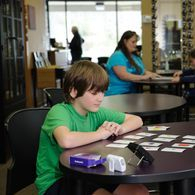 Students of all ages often find the neuropsychological evaluation to be fun and interesting.